I Love Disney’s Dubs of Studio Ghibli’s Films. And I Hate Weaboos! A rather funny thing happened today as I logged into this site to post some impressions on Star Fox Zero (still to come). I noticed I had a new comment, and expected it to either be one of my regular commenters, or perhaps a bit of spam that needed to be thrown out. What it was instead was something a bit more hilarious. This comment was left on my review of Studio Ghibli’s Castle in the Sky, and though I was tempted to approve it just so I could reply with a certain infamous Billy Madison quote, I ultimately decided against it, as to not give the depressing creature who left it the opportunity to leave more comments and lower the IQs of anyone who read them. I will, however, copy and paste the comment right here, for a bit of a chuckle and to dissect just a few of the countless things wrong with it (I don’t have an eternity to pinpoint them all). Here is said comment, with the stronger language censored out because I like to keep things respectable around here. “So you’ve decided to view the Disney dub instead of the PERFECT Japanese version or the REALLY PERFECT JAL LEnglish dub? You seriously think all these guys do a great job? You are a real moron if you think that. Every one of these actors all give the absolute WORST PERFORMANCES OF THEIR ENTIRE CAREERS. F*** Disney for butchering Miyazaki’s movies. Seriously, F*** THEM. And you, STOP praising the Disney dubs. They are all a crime against humanity and you have no business calling yourself a REAL Ghibli fan. JUST STOP. Before I point out some of the criminal acts against human intelligence that are rampant in this comment, I’d like to point out that the commenter left the comment under the name “Real Fan.” That right there was already eye-rolling. I’ve always detested how fandoms seem to think being a fan of something means completely surrendering to a very, very specific mindset. Last I checked, being a fan of something meant you enjoyed something to a particularly strong extent. I guess I was mistaken, and apparently being a fan of something means to brainwash yourself and being a part of some bizarre hive-mind that blindly follows a certain set of rules, completely ignorant to the merits of finding even the tiniest shred of individuality. One of the things I found most hilarious about this comment is how Weabboo Nazi “Real Fan” mentioned learning to read subtitles. I have been watching Studio Ghibli (and other foreign films) for many, many years. I have seen most of Ghibli’s films numerous times, both in English and in Japanese with subtitles. I have watched Castle in the Sky in particular many times in both languages, and my review was based on the film as a whole, with the English dub being mentioned because it’s worth mentioning. But I also enjoy watching the original Japanese version as well. How about that? Variety! Such blasphemy! Now, it’s also quite hilarious how this individual considers the actors in the Ghibli dubs to be “talentless celebrities who can’t act” while praising the recycled actors of other anime dubs. Let’s look at some of the individuals who have provided vocal work in Disney’s dubs of Ghibli’s films, shall we? Christian Bale, Liam Neeson, Mark Hamill, Lauren Bacall, Michael Keaton, Cate Blanchett, Will Arnett, Amy Poehler, Anne Hathaway, Cloris Leachman, Patrick Stewart, Billy Crystal, and even veteran voice actors like David Ogden Stiers, just to name a few. But, y’know, they’re all talentless for some reason. I don’t know, but I’d rather hear credible actors voicing these characters and giving them unique flair than hearing the same-old cliched “anime actors” that you often hear, with the nasally voices and high-pitched squeals. Now, are all the voices Disney gets perfect? No. As I stated in the Castle in the Sky review, Anna Paquin and James Van Der Beek, while giving solid performances, sound a tad too old for the characters of Sheeta and Pazu. But Mark Hamill’s vocal work has arguably never been better than it was as Colonel Muska. See, I actually like to form an opinion based on the performances, instead of blindly thinking a dub is innately inferior just because it’s in English, or that Disney somehow automatically ruins what it touches (I don’t know, I’d rather have the people at Disney and Pixar – who know a little thing or two about animated films – work on these movies as opposed to a typical dubbing studio who would cast the same few actors into every role because it’s cheap and easy). But I guess Disney’s just butchering these animated classics because they hire actors with credibility. Oh, and for the record, while I rather enjoy Disney’s dub of My Neighbor Totoro, I do indeed prefer the original dub provided by 20th Century Fox in that particular instance. So I don’t simply think Disney’s input automatically makes them better, either. Also, what’s with the needless swearing? I’m not about to judge someone for the language they use, but what’s the reason for it here? Did the idea of me liking something that they’re too ignorant to keep an open-mind about offend them? I mean, what’s the deal there? And all the name-calling. Geez! You’d find more maturity in a Michael Bay film. Perhaps the funniest bit of this whole incoherent rambling is in the last paragraph, when this hopeless creature commands me to watch them in “Japanese ONLY OR the ABSOLUTELY PERFECT Non-Disney dubs” (I have no earthly idea what kind of consistency they were aiming for with that capitalization). Apparently, if I dare watch the Disney dubs, I’m not a “real” fan. Well, if being a “real fan” means having such a communistic and dictatorial ruleset that I have to follow, then I guess I’d rather not be a real fan. I guess I’m just happy with, y’know, enjoying something and finding some form of inspiration in it. I guess I’m happy with appreciating the quality and effort that goes into a movie, and occasionally buying a T-shirt or a bit of merchandise based on it. I guess I’m happy with talking about something and finding a connection with someone else who might enjoy it. But, y’know, not a real fan. Because Disney. Is this really what fandoms are becoming? It outright depresses me that such a lack of intelligence and human decency could spawn from any entity who is actually aware of such joyous things as Studio Ghibli movies. Is simply appreciating a dub really such a grave offense to these people? But I’m guessing drawing perverted fanart and writing nonsensical fanfictions wherein the writers ship themselves with their favorite characters is A-okay though, right? Yes, I love Disney’s dubs of Studio Ghibli’s films. Not all of them are perfect, but oh well. There is an obvious “labor of love” factor that goes into Disney’s dubs of Studio Ghibli’s films (the Disney and Pixar employees can’t sing Miyazaki and co’s praises enough, so they clearly aren’t aiming to “butcher” anything about them). Disney gets big name actors because they care about the dubs, and in many cases (as with Christian Bale and Liam Neeson), the big name actors wanted to be a part of them because they themselves are fans. And let’s not forget that the very reason why Disney has the rights to most of Studio Ghibli’s output is because they are the only studio who made it a point to not edit anything about Ghibli’s films, adding in the English vocal tracks but leaving everything else in place. Would these “real fans” prefer someone got a hold of Ghibli’s films and made a bunch of glaring edits? Perhaps “weaboo” isn’t the exact word for such undeservedly demanding “fans” (whom I’m assuming don’t even contribute to the things they claim to like, and instead pirate them online because it doesn’t require anything on their part), but when talking about Japanese animation, “weaboo” seems to be the more negative form of “otaku” as far as my knowledge goes. Any fandom that has such twisted perceptions on what is required of someone in order to be considered a “real fan” is a terrible, terrible thing. But this seems to be a particularly vile epidemic when it comes to the realms of Japanese animation. While there is a lot of crap in the world of Japanese animation, it has also provided many great works of art. At the peak of the mountain of quality Japanese animation are the films of Studio Ghibli. Such wonderful works of art should be represented by respectable appreciators. They deserve to have fans worthy of their qualities. Anyone who is so willingly ignorant to the potential qualities of liking something in a different way is unfit to call themselves a fan of anything. This is doubly true for anything as charming as Studio Ghibli films. I’ll continue liking things. Real fan or not. The reason I leave most anime fanbases and fandoms alone is because of these “Real Fans”. The Sub VS. Dub thing has been going on for-who-knows-how-long, and it’s really annoying. We can’t judge people for what language option we use. “Also, what’s with the needless swearing? “. Really good point there, as well. I’ve seen some people on the comment sections on YouTube act like five-year-olds over someone liking one video game (The SMT fanbase is a huge offender.). Heck, I saw some last night, where a user was complaining about one game, and someone came in and cursed at him a bunch. It’s like he/she/attackhelicopter doesn’t know how to be at least decent with their thoughts. Truly, Fawful needed to laugh at that “Real Fan”‘s stupidity. Weirdly, I’ve never received any comments that dumb. I remember one person on another site getting peeved because I gave ActRaiser a 7/10, but even then, it was more amusing than anything else. The worst one I got on my site so far was somebody asking something to effect of “Aren’t you a little late reviewing [Call of Duty 4]?” Never mind the fact that some of the observations I made wouldn’t have been possible had I reviewed it back in 2009 when I first played it (such as the subgenre’s deterioration in quality). I don’t really get the whole dub vs. sub debate. Granted, I have seen a few instances where the dub is of a less-than-stellar quality, but if it’s good, I don’t see what the point is in tearing into people who watch it that way. It’s egotism, isn’t it? “You have to enjoy things the way I do because heaven forbid you have your own point of view.” With people like that, you could never meet their standards. If you did, they’d just move the goalposts to ensure that to them, you’re wrong. When you think about it, they can’t even meet their own standards. All I can say is that I’m glad they don’t have any real power. Could you imagine how awful that would be? It would probably lead to a real-life 1984 scenario where they would deprive the citizens of free will and expunge those who don’t agree from the history books. In short, this is why I don’t hang around with fandoms. I’m pretty sure that with almost any given fandom, I have at least one opinion that would’ve gotten me thrown out anyway. Besides, if being a real fan means acting in accordance with a hive mind that has the level of maturity of someone a third of the age of the average member, I’d say it’s a compliment to not be called a real fan. You’re trying to talk sense with people who want to be outraged and will invent boogie-men in order to take place in said outrage. One thing I’ve learned, especially from the internet, is that it doesn’t matter how many shades of gray there are. Most folks can only grasp the two at the far ends: Black or White. I’m not above calling the majority of people out there stupid because… well, they are. Everything is gray. There is no black. There is no white. Try explaining that to most folks though and you’ll be looked at like some sort of alien. Believe me. It’s happened to me so many times before and I have been driven from sites in the past for refusing to join this side or that knowing full well that both were wrong in their own way. If there’s anything that I recommend you check out, you should read “The Japanophile’s Handbook” by Alexei Maxim Russell, to learn more about the dreaded weeaboo and how to avoid becoming one. Seriously, you should check it out. It’s a good read. 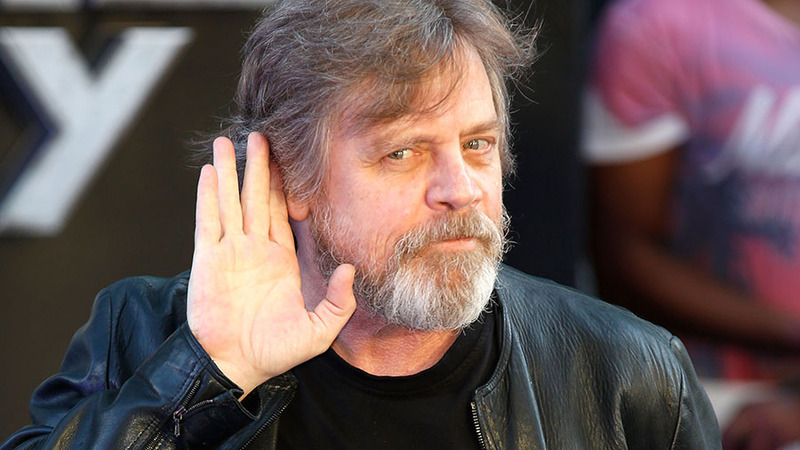 Who doesn’t love Mark Hamill?